I love Rodarte. If I ever have my fantasy fashion slumber party, I would put these two ladies between Zac Posen and Lady Becks, just to see who got their bra frozen first. For my guest shot on Game of Thrones I will wear this- I want Rhonda to do a full Saturday Sleeve episode on this one for me- who’s signing my petition? OOOH!!! We need a shoe intervention…STAT! These clompers are hurting my soul! Ring Toss wear for Bikers? Insert your own thought here- I’m overwhelmed…. This is what Thors date wore to Homecoming: This is textural to the point of scratchy… Your thoughts on texture and slumber party hazing? **psst! Don’t forget the SC Pattern Pyramid launch on 9/15….enter soon! Shoulda been a biker chick cos I’m loving that red & black number. I’m just imagining what the sewing instructions would be like for some of them. Burda eat your heart out. It is all so detailed and I want to touch it, but boy, you are right about the construction- it would kill me! love the dark teal one and the one with the red bodice! These are just too cool for Natalie portman- they need a new muse! The pink one looks like the head of a transformer…. Do people really wear those clothes? Is it the fan-folded bosom or the carwash fringing that did it for you? Ask and ye shall receive!!! I’ll put it in the line up. Great post. Yay!! You are the best! I am so intrigued by the orange jacket, I’d love to watch this DIY drape! FORM without FUNCTION; a common problem in art school students. Designing a building that people are unable to habitate. Designing a chair that is uncomfortable to sit in. (Often, I’ve seen far better clothing designs on ETSY from passionate, talented, ‘small’, designers than from the majority of the big names.) I’m not impressed with these at all. I have to work too hard at it to find aspects that appeal. Just me; each to their own. It certainly isn’t everyday people wear, is it? Unless you happen to be Daphne Guinness…but I still want to touch it! i admire the ability to innovate in a field where just about everything has been done already. many of their details are inspiring, but for me there is just too much going on in each piece! Is that almost a smile on the first model? I’m not keen on the heavy pleating/folds. I mean, they look really cool, but not something I would do for myself. I think the mix of firm curved edges and the flowy skirt of the 4th dress, the teal one, is what appeals to me the most. Oh and yes, I’m not a fan of the shoes with the pretty dresses. Too clunky for my taste and they would make me look even shorter. They look like there is an orthopaedic function to the shoes. I think that first model is Liberty Ross, perhaps. Does anyone know for sure? Another fun, wearable Wednesday post! Interesting fashions – not my personal style, but some interesting ideas and fabrics. Now – here’s a show you simply MUST review for us, if you dare! If you caught the Versace Mens (?) Wear show, you may have been a teeny bit surprised at the direction Versace sees menswear heading. Here’s the link, with a disclaimer: NOT responsible for liquid spewed across keyboards, monitors, etc. Put all drinks down prior to opening link. Oh, my….my first thought is that Donatella is angry at men. my other thought is that none of this is menswear, it’s womens wear tailored differently….scary! Would LOVE to know what the models are thinking…! I’m going to have tears soon. That is just… wow. It’s like they forgot to put pants on, and then when they did it somehow got worse. You are so not kidding with the beverage warning. It should be April 1st for such antics! I know! At first I thought…”Aww…those look normal…pants…” Then I snapped out of it! Definitely an April Fool’s day collection. We’d better NOT see any of this junk walking the red carpet…! I love the red bodice/black number…would definitely wear if I were young, rich and had somewhere to go. Guess they all are a bit much, but the fabrics I do like! I’d definitely like to play in their fabric bins! Obviously the red bodice one is for wearing over the holidays as it is embellished with fake holly berries…how Michael’s crafty is that? The shoes…make me want to pull out my eyeballs! I agree the orange jacket would be a delight to see draped AND stitched! The rest of the dresses looked like they wanted to use every last bit of leftover fabric on the table…let’s do epaulets on the pink one…not enough chiffon for a full skirt?..nevermind, just use what’s left…As for the men’s wear…it is just too gay to imagine! Why does my mind keep going back to Vanilla Ice…? That Versace just makes me think of Rocky Horror a little too much! Oooo textures…. colours… interesting shapes and fabric manipulation! I love these; they’re works of art! I WANT that teal dress with the awesome gold & teal corset thingie…. how cool is that? And the jacket with the orange folds…. awesome! Its all so interesting and detailed! 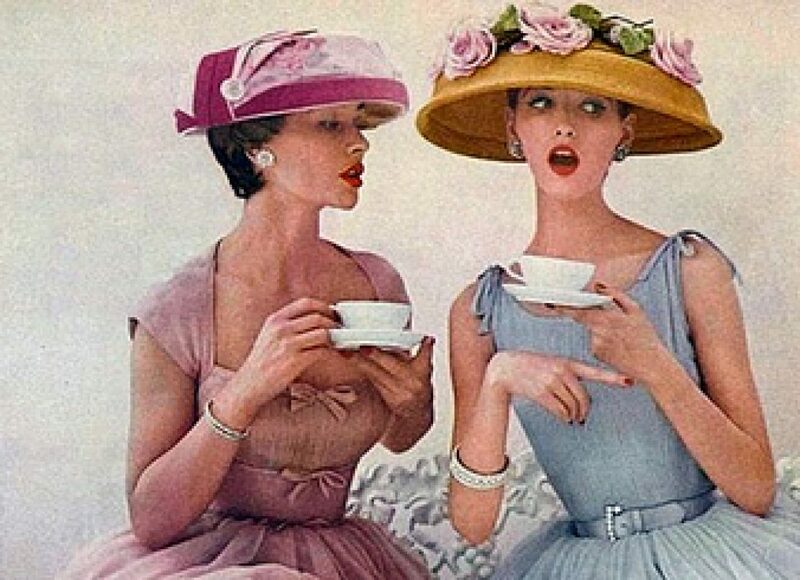 Come on, make the teal dress for us to see…. Maybe I’m stuffy, but apart from the first dress. the red bodice dress and that fabulous blue with the steel corset for a midriff, I’m really not liking any of it. It seems like he couldn’t make up his mind about the textures and colours – lessons in cohesion, maybe? It seems very unlike the stuff that I’ve seen on people that actually works. I mean, is he trying to summarize Snow White & the Hunstman in the last one? And I think Versace needs some serious help over there… You *do* need to do a WW post on that one. Maybe 2 designers aren’t better than one! Tim gunn might say its time to be editorial, kids! Wow. I’m lovin’ that collection so much I have nothing to say. You’ve got to check out the rest! Your posts consistently crack me up! I really do like the teal dress but you’re completely correct about the shoes. They hurt my heart, they do. Oh dear but the colours are lovely. And the details. Though. Well, where would one wear such pieces? Perhaps to the skating rink with the kids? Oh, my google searches are going to get weird again, aren’t they? i absolutely adore Rodarte too. 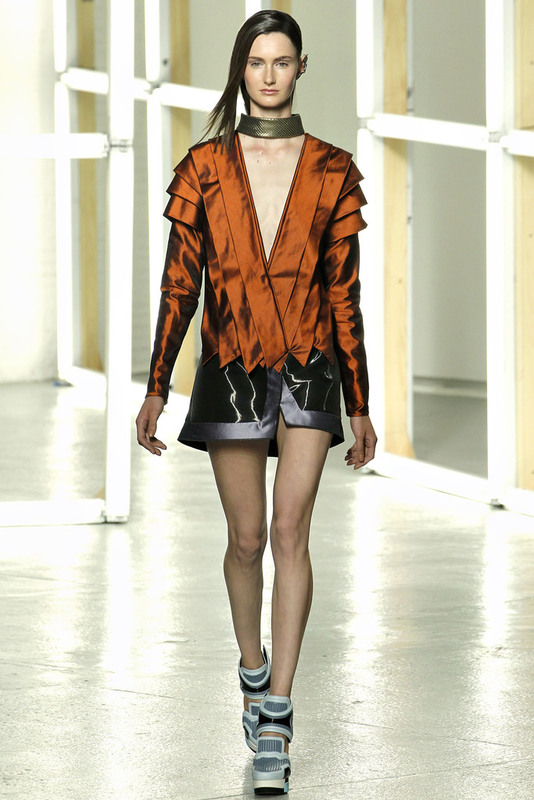 That orange jacket is amazingly beautiful, I loooove the diagonal jagged panels along the front, and those sleeves! This is real inspiration…. I think Rhonda is going to make us proud! Firstly, I hate being back at work as it makes me late for Wearable Wednesday and so my comments are only formed by Friday! 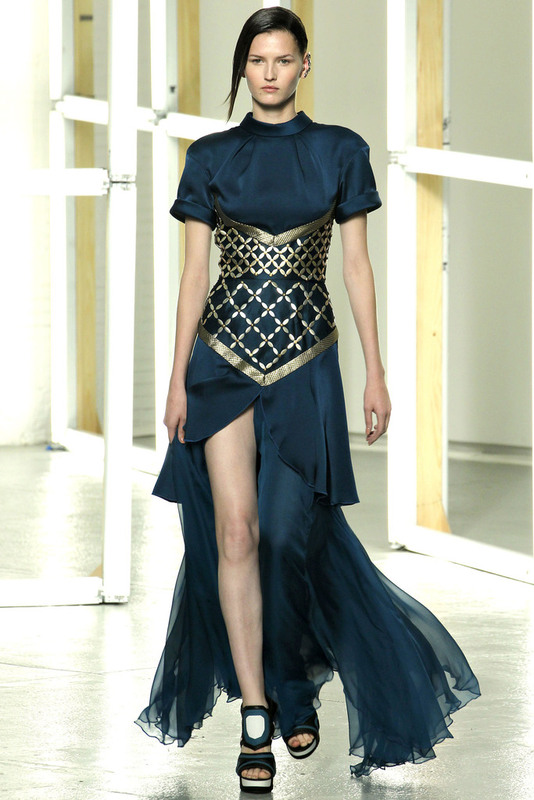 That said – I adore Rodarte. I admired their winter coats so much last year that I bought a load of patterns thinking I could adapt them to match the Rodarte style. Secretly, I think I belong in Montana but rounding up the cattle in these little frocks might prove to be a challenge. I’m all for Rhonda doing a sleeve on the orange. I swear, no matter how creepy Black swan got, there was always a fabulous shrug to admire! Your WW fashion commentary is the best- totally cracks me up. If I’d had a voice like yours inside my head when I worked in fashion maybe it wouldn’t have ended in tears. Should be required reading for po-faced fashionistas everywhere to help them lighten up!